On May 17, the “Japan-Pacific Island Countries Economic Forum”, a related project of the 8th Pacific Islands Leaders Meeting (so-called “PALM 8”), was held in Tokyo by the Ministry of Foreign Affairs and co-hosted by JAPIA (Japan Pacific Islands Association), JETRO (Japan External Trade Organization) and PIC (Pacific Islands Center). 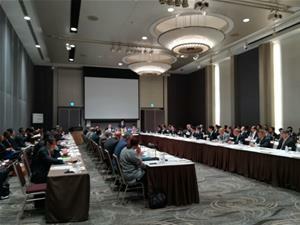 The Forum was attended by notable guests such as Mr. Nakane, the State Minister of Foreign Affairs, top officials from 13 countries and regions of Pacific Islands, and 25 top executives from Japanese companies and organizations that are interested in or deeply involved with the island countries. They exchanged ideas directly with each other on how to revitalize the trade and investment between the Pacific Island Countries and Japan. The forum was facilitated by Mr. Saito, PIC Director, and Ms. Sato, JETRO Director. Mr. Nakane started by extending a welcome greeting, followed by remarks from Prime Minister Tuilaepa of the Independent State of Samoa on behalf of the Pacific Island Countries, as well as Mr. Kitano, Chairman of JAPIA (also Chairman and President of Kitano Construction) with the introduction of participating Japanese companies / organizations. Following that, Mr. Houenipwela, Prime Minister of the Solomon Islands, and Mr. Bainimarama, Prime Minister and Foreign Minister of the Republic of Fiji, made presentations on the attractiveness of the Island Countries as investment destinations of Japanese companies. In return, Japanese companies introduced their activities in “renewable energy”, “indoor farming”, and “medical container” that the Island countries are interested in. There were direct and vigorous exchanges of views between the participating leaders and Japanese companies and organizations at the Q and A sessions after a coffee break. It is hoped that further exchanges will be activated with future results in mind. 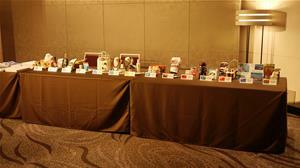 Finally, we displayed a PIC exhibition area in the venue, introducing products from14 island countries, which attracted interest from the participants.